So, I’ve written 2 serialized murder mysteries about the digerati in SF: iMurder (start here), and Killerizr (start here). Not so loosely based on popular social apps and the geeks that build them. Why? Because I absolutely love noir in SF and writing a series is so much fun. OK, it’s hard work, but a lot of fun. – Watching *a lot* of Law & Order: Criminal Intent. No, my crush on Vincent d’Onofrio does not have anything to do with that. 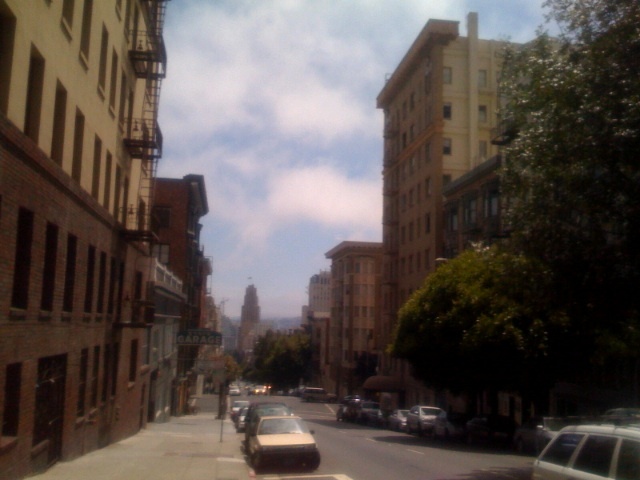 – Walking around SF finding hidden alleys and odd trivial tidbits (on the way to my usual errands, TJ’s, Walgreens & the library). Yes, it’s a 2-block radius but a lot can happen in those 2 blocks of North Beach. As I answered the Judge at jury interviews, “No, I do no research for my mysteries.” Feel comforted? There was no preparation involved. Except, I need a name!!! Written Wednesday, August 6th, 2008 in about writing. You can leave a response, or trackback from your own site. ooh, this is a hard one. titling anything is always terribly difficult. i'd say keep with iMurder, and then have different “flavors,” like iMurder: Noooose (play off of zoooomer, or however many o's there are in there). but it's hard to come up with a title if you don't know how people are dying. and i find mystery titles so cliche these days. and i have a crush on Vincent d'Onofrio too, but i seriously had problems in the beginning of the series, because he was so creepy that it reminded me of is character in Full Metal Jacket. i can't wait for the new series! and jealous that someone is getting some real writing done this summer. i can barely get a blog post that i don't hate out the door, never mind any stories or poetry. How about “Death Awaits You”? Before depressing nozzle I used that war cry on my roomate ants who refused to contribute rent even after repeated requests. “Black Flag” – don't see on keyboard but may have to use an encircled r to avoid hassle – is also ominous. Good luck. Look forward to series.